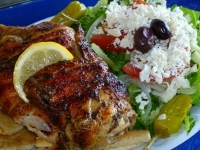 Liz & Jerry G.Bishop & son Chris & daughter Melissa invite you to the closest thing to an authentic Greek seaside cafe in the United States...the Greek Islands. Cafe in beautiful Seaport Village on San Diego Bay. Only steps from San Diego's landmark Convention Center, you'll be able to enjoy the waters edge wonders of dining on authentic Grecian delicacies like flame broiled Gyros & shishkabob, succulent lemon chicken cooked on a rotating spit, plus traditional recipes such as spanikopita (spinach/cheese pie), dolmades (beef / rice stuffed grape leaves, grilled lamb chops & pastetsio (a Grecian lasagna with a creamy custardy topping). In addition, don't miss baked-in-our-own-ovens Greek pastries -- koularakia, galatoburiko, and last but certainly not least, Peggys amazing baklava, oozing with honey & walnuts, baked in papery fillo dough. Peggy - born at the foot of Mt Olympus in northern Greece, has been our cook for over 30 years we've been in business. Regulars like to begin their visit to the Greek Islands Cafe with a Greek beer or a glass of Greek wine (also sold by the bottle) & our flaming cheese appetizer - Saganaki (don't forget to shout "oopah!" when you see the flames!) & finish with a Demi cup of Flavorful, thick Greek coffee, prepared the traditional way. It's like a mini-visit to the fabled Greek Islands without leaving our shores.